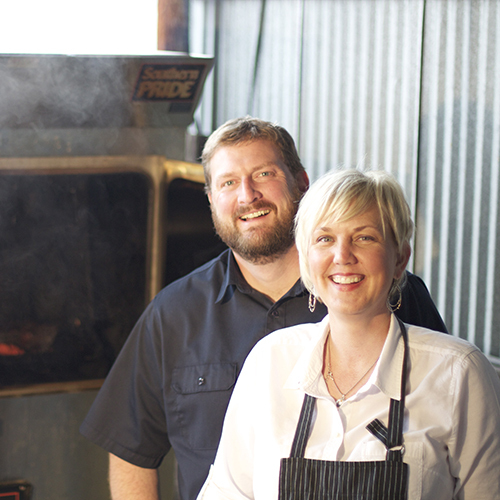 Located at the intersection of Old State Street and Eagle Road, Bodacious Pig Barbecue brings together the experience of husband and wife restaurateurs Joel and Tricia Anderson to create a traditional meets contemporary barbecue experience in the heart of downtown Eagle. Pit-master Joel brings over 10 years of experience to the table cooking Bodacious Pig’s barbecue. Joel gets up early to smoke the meats fresh each day. Slow smoked barbecue done right takes several hours and special technique to develop mouth watering flavor. Joel has to cook all of the restaurants meats before everyone arrives, so everyday is a guessing game on how much business the restaurant will do. Bodacious Pig does not serve reheated, twice cooked meat, so when BP sells out of meat for the day, it’s gone! BP’s advice: Get here early! Tricia honed in her culinary skills at The Culinary Center in Monterey, CA. and at Joel and Tricia’s first restaurant in Hollister, CA, Maverick BBQ. While Joel is busy smoking the meats in the morning Tricia is busy preparing BP’s house made soups, hand-washed salads, sandwiches, steaks, seafood, side dishes and desserts! The word “Bodacious” means remarkable, outstanding, bold and audacious, and we think the adjective describes us perfectly! Located in the community of Eagle, Idaho, “BP” offers Idahoans a hip, casual atmosphere, that’s an affordable place to enjoy great barbecue cooked right. With over 10 years of experience, BP’s “pit master,” Joel, slow smokes our premium meats each day on a Southern Pride pit. Joel prepares BP’s barbecue fresh each day the old fashioned way, no short cuts, and when we sell out, it’s gone! At The Bodacious Pig, we dry rub our BBQ and slow smoke it for hours until it’s perfect. All of our appetizers, side dishes, and desserts will be made in-house daily by the Chef/Owners. The tender lovin’ technique that we use to make all of our food will draw customers in for miles. Former customers have told us that our food is so good, it’s addictive! We sell wine and beer! At Bodacious Pig Barbecue we treat our customers the same way we treat our food, with tender lovin’ care!